on the organic garden at Santa Barbara City College. You have to dig deep to see the magic in an organic garden. compost, says student and teacher's assistant Drew Wolter. It's mixed in with the soil. 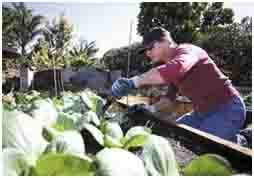 When not destroyed by pesticides and herbicides, microbes, or tiny organisms, flourish below the ground in a mixture of soil and compost, explained Mark Broomfield, steward of Santa Barbara City College's organic lifescape garden and a horticulture major. "The microbes are maintaining the fertility of the soil. Without them, the soil is sterile. It's like storing nitro (nitrogen) in a bank. If the door is open, all the money flows out. They (microbes) hold the doors shut and keep nitro in and keep making the nitro. They keep filling up the bank." Standing next to Mr. Broomfield in City College's plant-filled greenhouse, Mike Gonella smiled mischievously and said, "They don't need a big nitrogen bailout!" You can bank on the advantages of organic farming, which also include lower material costs, less risk to consumers' health and crops with more vitamins, said Dr. Gonella, chair of the environmental horticulture department. steward of the entire lifescape garden, put in time on the plot. The students mixed the donated compost with the soil in eight 8-foot-by-4-foot raised redwood beds that stand a foot above the ground. The dirt-and-compost mixture goes a foot below the ground to ensure the vegetables' roots get the full benefit, and the students installed a wire mesh below that to keep out the gophers who plagued last year's garden, Mr. Broomfield explained. 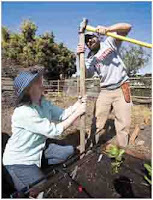 Students built the raised beds between November 2011 and early February, and eight more will be built, said Dr. Gonella, who earned a doctorate degree in botany in 2007 at Miami University in Oxford, Ohio, just before coming to City College. To deter birds, a wire mesh is placed above the crops, which include broccoli, kale, lettuce, parsley, bok choy, fennel, arugula, lettuce, chard, fava beans, cilantro and herbs. After students have used up Agromin's compost, they'll make their own, using fallen leaves and branches from the campus. Drew Wolter, a teacher's assistant and horticulture major who has worked on the garden, stressed the importance of the compost as a natural fertilizer. "Getting that into the vegetable garden is the most essential thing you can do." The City College garden is not only organic; it's for a good cause. Dr. Gonella expects to harvest the veggies by May or June and donate half of the produce to the Foodbank of Santa Barbara County. Another quarter will go to City College's School of Culinary Arts and Hotel Management. Students and college employees will eat the rest. Among other things, the garden is teaching students about being efficient with water using a slow-drip irrigation system, Dr. Gonella said. 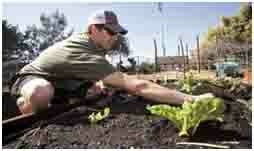 In addition, culinary arts teachers will bring their students to the garden and greenhouse to show how food is raised. Besides tending the vegetable garden, horticulture students raise a variety of fruit trees. Ultimately, the vegetable garden will prepare horticulture students for their careers, Dr. Gonella said. He explained organic farming is the future for agriculture at a time of awareness about the impact on health. The Environmental Protection Agency has said some pesticides might be carcinogens and others may affect the endocrine system. There's a safer way to farm, Dr. Gonella said. Students are planting flowers in the garden to attract good insects to get rid of the bad ones. "The ladybug larvae will munch on the aphids," he said as an example. "The whole horticulture program is about sustainable landscaping," Dr. Gonella continued. "It's to train students for jobs in the current market. When people ask, 'Can you build me a garden?,' they don't usually ask, 'Can you build me a garden and spray pesticides on it?'"